Screech's Sprint is the thirty-fourth level of Donkey Kong Country 2: Diddy's Kong Quest. It is the only level on the The Flying Krock and is also the game's final level, not counting the Lost World. 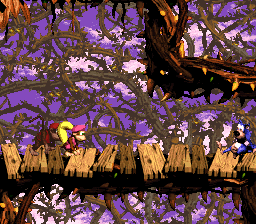 The first half of this bramble level is similar to other bramble levels of the game, where Diddy and Dixie Kong must climb vines and dodge brambles, while the second half is a race against Screech. In this portion of the level, the Kongs transform into Squawks, who must race Screech to the finish line at the end of the level. In order to succeed, Squawks needs to hurry without touching any thorns, and at the same time, avoid many Zingers in his way. If Squawks loses the race, he will also lose a life, so winning is mandatory. In addition to Screech and the Zingers, Klingers, Kloaks, Kabooms, Cat O' 9 Tails, Flitters, and Mini-Neckies are also found here. From the start of the level, the Kongs must cross a small gap and defeat a Cat O' 9 Tails. Then, they need to cartwheel-jump across another gap and later dodge a Kloak, and deal with the Kaboom it throws. Once the foe floats away, they should carefully jump over the brambles and cling onto some ropes, with Klingers on them. Without hitting the Kremlings, the heroes must climb across all the ropes and get to the next platform. After that, they must hop over more brambles and climb across another vine, while moving past a group of four Zingers. Then, they should let go of the rope and pass two Cat O' 9 Tails. After that, the monkeys must cling onto a vine and climb up, but while watching out for several Mini Neckies that will swoop down at them. At the top, the will have to leap to the platform to the left hand side and begin to jump platform to platform over the brambles. Eventually, they will come up to the Star Barrel, as well as an Animal Barrel that will turn them into Squawks. Halfway through the level, Squawks will meet up with Screech, and shortly after, race him. When the race begins, Squawks will have to hurry west and then survive the twists and turns of the bramble surrounded track. Soon, he will need to travel a far distance north and then turn east, beating all the Zinger in his path. After that, he must follow the banana arrow pointing south. The parrot will come up to many twists and turns in the track shortly after going here, and get through what seems to be a maze between many, many brambles. Using the banana trail for help, the bird should make his way out of the maze to avoid trouble, and then move east again. Once Squawks defeats all the Zingers in the way here, he must zig-zag his way up north, and then turn west shortly after. While he travels in this area, he will have to maneuver around several red Zingers, who can not be defeated. At the end of this path, the parrot must continue through and fly north between the sharp brambles. After getting through this narrow passageway, he should quickly beat some Zinger and cross the finish line. If he was able to beat Screech, he may continue through the level, and cross the No Animal Sign, turning him back into the Kongs. Then, the no longer transformed monkeys must simply hit the End of Level Target and exit Screech's Sprint. The Kongs travelling through the Bonus Level. Shortly before the Star Barrel, the Kongs must use their Team-up move and throw one another up to a high platform with a kannonball on it. A kannon is to the right, and they must load it with the kannonball and then enter it themselves to be shot to a Bonus Level. Here, the player needs to use Dixie Kong to hover through several long abysses and either Kong's cartwheel jump to cross long sections of brambles. If they touch a bramble or fail to complete it within 35 seconds, they lose the Bonus Stage. After they make their way to the bottom of the area, the heroes find the Kremkoin. At some point in the race, Squawks has to travel south for the first time. At this point, he'll see another pathway continuing east. He should take this pathway, and fly between the twisted brambles, until he finds his way to the DK Coin. After the passing DK Coin, Squawks should see the Golden Feather in plain sight between the brambles in a small opening. They must squeeze through the opening, trying not to get damaged, and grab the feather. This level's photograph is found differently than in other levels. To get it, the heroes need to finish the level before 1:20:00, and the photo will be theirs. This will add a picture of Screech to the third page of their scrapbook. After the start of the race, just before the player first starts to head upwards, if they instead head low and to the left, there is an invisible Barrel Cannon between some thorns that will fire to the left and upwards. Squawks and Screech race in the Game Boy Advance remake. This page was last edited on April 17, 2019, at 22:56.